The Cross of Christ was mysteriously proclaimed in advance and foreshadowed from generations of old and no one was ever reconciled with God except by the power of the Cross. After our First Parents transgressed against God through the tree in paradise, sin came to life, but we died, submitting, even before physical death, to the death of the soul, its separation from God. After the transgression we lived in sin and according to the flesh. Sin “is not subject to the law of God, neither indeed can be. So then they that are in the flesh cannot please God” (Romans 8.7-8). As the apostle says, “The flesh lusteth against the Spirit, and the Spirit against the flesh” (Galatians 5.17). God, however, is Spirit, absolute Goodness and Virtue, and our own spirit is after His image and likeness, although sin has made it good for nothing. So how could anyone at all be spiritually renewed and reconciled with God, unless sin and life according to the flesh had been abolished? The Cross of Christ is this abolition of sin. One of our God-bearing Fathers was asked by an unbeliever if he really believed in Christ crucified. “Yes”, he replied, “I believe in Him who crucified sin.” God Himself has borne witness that there were many who were His friends before and after the law, when the Cross had not yet been revealed. David, the king and prophet, says, as if there were definitely friends of God in his day, “How precious also are thy friends unto me, O God!” (Psalm 139.17 LXX). I shall now show you, if you listen attentively for the love of God, how it was that people were called friends of God before the Cross. Although the man of sin, the son of lawlessness (2 Thessalonians 2.3), by which I mean the Antichrist, has not yet come, the theologian whom Christ loved says, “Even now, Beloved, there is antichrist” (1 John 2.18). In the same way, the Cross existed in the time of our ancestors, even before it was accomplished. The great Paul teaches us absolutely clearly that Antichrist is among us, even though he has not yet come, saying, “His mystery doth already work in you” (2 Thessalonians 2.7). In exactly the same way Christ’s Cross was among our forefathers before it came into being, because its mystery was working in them. Leaving aside Abel, Seth, Enos, Enoch, Noah, and all those up until Noah who were pleasing to God, and their contemporaries, I shall begin with Abraham, who was called the father of many nations, the Jews’ father after the flesh and ours by faith. As I am to start with this spiritual father of ours, his good beginning and God’s initial call to him, what were the first words God spoke to him? “Get thee out of thy country, and from thy kindred, unto a land that I will show thee” (Genesis 12.1). This utterance certainly bears within it the mystery of the Cross, for it is exactly what Paul says when he glories in the Cross: “The world is crucified unto me” (Galatians 6.14). When someone had fled his home country or the world without turning back, for him his country according to the flesh and the world have been put to death and ceased to exist, and this is the Cross. God said to Abraham, before he had fled from his life with ungodly men, “Get thee out of thy country unto a land”, not, that I will give thee, but “that I will show thee” (Genesis 12.1), so that through this land another, spiritual land might be shown. What were God’s first words to Moses once he had fled from Egypt and ascended the mountain? “Put off thy shoes from off thy feet” (Exodus 3.5). This is another mystery of the Cross which follows appropriately upon the first. “You have come out of Egypt”, says God, “you have left the service of Pharaoh, and have despised the fact that you were called the son of Pharaoh’s daughter. That world of evil servitude has been dissolved and ceased to exist, as far as you are concerned. Nevertheless you still need something more.” What can that be? “To take your shoes from off your feet, to lay aside the coats of skin (Genesis 3.21) with which sin clothed you and in which it is at work, separating you from the holy ground. Take these shoes from your feet”, which is to say, “do not live any longer according to the flesh and in sin, but let that life which is opposed to God be abolished and put to death. And let the way of thinking based on the flesh (Romans 8.6-7), and the law in your members warring against the law of your mind, and bringing you into captivity to the law of sin (Romans 7.23-8.2), no longer hold sway, nor be active, for it has been put to death by the power of this vision of God.” Surely this is the Cross. In the divine Paul’s words, the Cross is to have crucified “the flesh with the afflictions and lusts” (Galatians 5.24). “Put off”, He says, “thy shoes from off thy feet” (Exodus 3.5). These words to Moses revealed that the earth was to be hallowed through the Cross after the manifestation of our Lord and God and Saviour Jesus Christ. At that time, as he looked at that great spectacle of the burning bush which seemed cool as the dew, Moses foresaw the coming of Christ, which was then in the future. The vision in God of the Cross is a mystery greater than that earlier mystery. 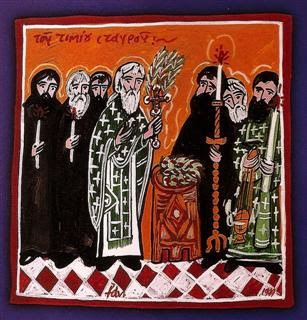 The great Paul and our holy Fathers hint that there are two mysteries. For Paul not only says, “The world is crucified unto me”, but adds, “and I to the world” (Galatians 6.14). The Fathers, for their part, command us not to hasten to ascend the cross before the Cross, as though there were definitely two words of the Cross and two mysteries. The first mystery of the Cross is flight from the world, and parting from our relatives according to the flesh, if they are a hindrance to piety and a devout life, and training our body, which Paul tells us is of some value (1 Timothy 4.8). In these ways the world and sin are crucified to us, once we have fled from them. According to the second mystery of the Cross, however, we are crucified to the world and the passions, once they have fled from us. It is not of course possible for them to leave us completely and not be at work in our thoughts, unless we attain to contemplation of God. When, through action, we approach contemplation and cultivate and cleanse our inner man, searching for the divine treasure which we ourselves have hidden, and considering the kingdom of God within us, then it is that we crucify ourselves to the world and the passions. Through meditation of this a certain warmth is born in our heart, which cleanses away evil thoughts like flies, instills spiritual peace and consolation in our soul, and bestows sanctification on our body. As the psalmist says, “My heart was hot within me, while I was musing the fire burned” (Psalm 39.3). One of our God-bearing Fathers taught us about this, saying, “Strive as hard as you can to ensure that your inner labour is according to God’s will, and you will conquer the outward passions.” The great Paul, urging us on in the same direction, says, “Walk in the Spirit, and ye shall not fulfill the lusts of the flesh” (Galatians 5.16). Elsewhere he exhorts, “Stand therefore, having your loins girt about with truth” (Ephesians 6.14). For the contemplative part of the soul strengthens and supports the part concerned with desires, and chases away fleshly lusts. The great Peter tells us with absolute clarity what the references to the loins and the truth mean. “Wherefore”, he says, “gird up the loins of your mind, be sober, and hope to the end for the grace that is to be brought unto you at the revelation of Jesus Christ” (1 Peter 1.13). Since it is not possible for the evil passions and the world to leave us completely and not be at work in our thoughts, unless we attain to contemplation of God, inasmuch as such contemplation is also the mystery of the Cross, which crucifies those who are worthy of it to the world. That vision which Moses had of the burning bush not consumed by the fire, was also a mystery of the Cross, greater and more perfect than the mystery in the time of Abraham. Is is then the case that Moses was initiated into the more perfect mystery of the Cross, whereas Abraham was not? That would be unreasonable. In fact, Abraham was not initiated at the time when he was called, but afterwards he was, once, twice, and in fact many times, though we do not have enough time to relate everything now. I shall remind you of Abraham’s most wonderful vision of God, when he clearly saw the one God in three persons, before He had been proclaimed to be such (Genesis 18.1-16). “The Lord appeared unto him by the oak of Mamre; and he lifted up his eyes and looked, and lo, three men stood by him: and he ran to meet them.” He actually saw the one God who appeared to him as three. “God appeared unto him”, it says, “and, lo, three men.” Having run to meet the three men, however, he addressed them as one, saying, “My Lord, if now I have found favour in thy sight, pass not away from thy servant.” The three then discourse with him as though they were one. “And he said unto Abraham, Where is Sarah thy wife? I will certainly return unto thee about this same time of year: and Sarah thy wife shall have a son.” As the aged Sarah laughed on hearing this, “the Lord said, Wherefore did Sarah laugh?” Notice that the one God is three hypostases, and the three hypostases are one Lord, for it says, “The Lord said”. This is how the mystery of the Cross worked in Abraham. As for Isaac, he himself prefigured Him who was nailed to the Cross for, like Christ, he was obedient to his father unto death. The ram offered instead of him (Genesis 22.13) clearly foreshadowed the Lamb of God who was led to the slaughter for our sake. Even the thicket in which the ram was caught contained the mystery of the sign of the Cross, for it was called the thicket of “Sabek”, meaning the thicket of forgiveness (Genesis 22.13 LXX), just as the Cross was called the wood of salvation. In Isaac’s son, Jacob, the mystery and sign of the Cross were also at work, for he increased his flocks by means of wood and water (Genesis 30.37-43). The wood prefigured the wood of the Cross, an the water, holy baptism, which holds within it the mystery of the Cross. “We were baptized into Christ’s death”, says the apostle (Romans 6.3). Christ, too, increased His human flocks by means of wood and water, the Cross and baptism. When Jacob bowed himself upon the end of his staff and blessed his grandchildren with his hand crossed (Genesis 48.9-20), he brought the sign of the Cross even more clearly to light. Because he was obedient to his forefathers from start to finish, he was beloved and blessed, even though Esau hated him for this. He bore every temptation with courage, and the mystery of the Cross was at work throughout his whole life. That is why God said, “Jacob have I loved, but Esau have I hated” (Romans 9.13 and Malachi 1.2-3). Something similar, brethren, happens in our case. When someone obeys his earthly and spiritual fathers in accordance with the apostolic commandment saying, “Children, obey your parents” (Ephesians 6.1), he is loved by God as having become in this respect like His beloved Son (Matthew 3.17; 17.5; Mark 1.11; 9.7; Luke 3.22; 9.35; 2 Peter 1.17). But the disobedient son is hateful to God because he is a stranger to any resemblance to His beloved Son. Solomon the wise man makes it clear that this does not just apply to Jacob and Esau, but to everyone at all times. “An obedient son”, he says, “is unto life: but the disobedient is unto destruction” (Proverbs 13.1 LXX). Surely Jacob, the son of obedience, attained to the greater mystery of the Cross, by which I mean the vision of God through which a person is more perfectly crucified to sin, dies to it and lives to virtue? He actually bears witness himself to his vision and his salvation. “For I have seen God”, he says, “face to face, and my soul is saved” (Genesis 32.30 LXX). Where are the people who still go along with the loathsome prattle of those heretics who have appeared in our day? Let them hear that Jacob saw God’s face, and not only did he not lose his life but, as he says himself, he was also saved, even though God said, “There shall no man see me, and live” (Exodus 33.20). Surely there cannot be two Gods, one whose face can be seen by the saints, the other whose face is above vision. Perish the impious thought! The face of God visible at the time of His manifestation to those who are worthy is His energy and grace. Whereas His face which is never seen is what is sometimes called the nature of God, and is beyond the scope of any manifestation or vision. As it is written, “No one hath stood in the substance and essence of the Lord” (Jeremiah 23.18 LXX), and either seen God’s nature or made it known. So contemplation in God and the sacred mystery of the Cross do not just drive away evil passions, and the devils who devise them, from the soul, but also heretical doctrines. They refute the advocates of such ideas, and thrust them outside the boundaries of Christ’s Holy Church, within which we have the privilege now to celebrate and declare the grace and energy of the Cross among our Fathers in the time before the Cross. The mystery of the Cross was working in Abraham, whereas his son Isaac himself prefigured the one who was afterwards crucified. In the same way, the mystery of the Cross was at work throughout Jacob’s life, while Jacob’s son Joseph was himself a type and mystery of the divine and human Word who was later crucified. Joseph was led to the slaughter through jealousy, by his kinsmen according to the flesh, for whose sake his father sent him, just as was later the case with Christ. We should not be surprised, however, that Joseph was not murdered but sold. Isaac was not killed either. These men prefigured the truth that was to come, but were not themselves this truth. We can, however, discern in them the twofold mystery of Christ’s twofold nature. Their being led to the slaughter foreshadowed the passion according to the flesh of Him who was the God-man, whereas the fact that they did not suffer foretold the impassible nature of His divinity. It was the same with regard to Jacob and Abraham. Although they were tempted, they were victorious, which is what the Scriptures clearly tell us about Christ. Of these four men who were renowned for their virtue and devoutness in the time before the law, two, Abraham and Jacob, had the mystery of the Cross at work in their lives, whereas the other two, Isaac and Joseph, themselves proclaimed the mystery of the Cross beforehand in a marvellous way. But what about Moses, who was the first to receive the law from God and to share it with others? He was himself saved by means of wood and water before the law was given, when he was exposed to the Nile’s currents, hidden away in an ark (Exodus 2.3-10). And by means of wood and water he saved the people of Israel, revealing the Cross by the wood, holy baptism by water. Paul, who had looked upon the mysteries, says openly, “They were all baptized into Moses in the cloud” (1 Corinthians 10.2). He also bears witness that, even before the events concerning the sea and his staff, Moses willingly endured Christ’s Cross, “Esteeming”, he says, “the reproach of Christ greater riches than the treasures of Egypt” (Hebrews 11.26). For the Cross is the reproach of Christ from the standpoint of foolish men. As Paul himself says of Christ, “He endured the Cross, despising the shame” (Hebrews 12.2). Far in advance, Moses proclaimed in the clearest possible way the figure and form of the Cross and the salvation this sign would bring. For he stood his staff upright and stretched out his hands above it and, when he had formed himself into the shape of a cross upon his staff, this sight completely routed Amalek (Exodus 17.8-13). Again, by placing the serpent of brass sideways upon a standard, he publicly raised up the sign of the Cross and commanded the Jews who had been bitten by serpents to look upon it as a means of salvation, and so he healed the serpents’ bites (Numbers 21.4-9). Time fails me to tell of Joshua and his fellow judges and prophets, or David and his successors who, by the working of the mystery of the Cross within them, dried up rivers (2 Kings 19.24; Isaiah 37.25), made the sun stand still (Joshua 10.13), razed the cities of the ungodly (Genesis 19.25; 2 Peter 2.6), became mighty in war, put foreign armies to flight, escaped the edge of the sword, quenched the violence of fire, stopped the mouths of lions, put kings to shame (Hebrews 11.33-34; Judges 4.6; 13.24; Daniel 6.23; 3.23-25, 49-50), reduced captains of fifty to ashes (2 Kings 1.13), raised the dead (1 Kings 17.23; 2 Kings 4.36), made the heavens stand still with a word (2 Kings 20.10-11), then let them go, preventing the clouds from giving rain, then letting them do so. If Paul says that faith has done all these things (Hebrews 11.32-40), it is because faith is power unto salvation, and all things are possible for him who believes. Clearly the Cross has this same power for believers. “For the preaching of the Cross”, to quote Paul again, “is to them that perish foolishness, but unto us which are being saved it is the power of God” (1 Corinthians 1.18). If we move on from all those who lived before or under the law, the Lord Himself, “for whom are all things, and by whom are all things” (Hebrews 2.10), said before the Cross, “He that taketh not his cross, and followeth after me, is not worthy of me” (Matthew 10.38). Notice that even before the Cross was fixed in the ground, it was the Cross which brought salvation. When the Lord spoke openly beforehand of His passion and death on the Cross, Peter could not bear to hear. Knowing the Lord’s power, he entreated Him, saying, “Be it far from thee, Lord: this shall not be unto thee” (Matthew 16.22). The Lord reprimanded him because in this respect his thinking was human not divine. And “when he had called the people unto him with his disciples also, he said unto them, Whosoever will come after me, let him deny himself, and take up his cross, and follow me. For whosoever will save his soul shall lose it; but whosoever shall lose his soul for my sake and the gospel’s, the same shall save it” (Mark 9.34-35; Luke 9.23; Matthew 16.24-25). He also invited the people together with his disciples, and then announced and proclaimed these great and marvellous thoughts which are obviously from God not from men. This was to make it clear that such things were not demanded solely of his chosen disciples, but of everyone who believes in Him. To follow Christ means to live according to His Gospel and to give proof of every virtue and of true piety. The fact that anyone wishing to follow Him must deny himself and take up his cross means he must not spare himself when the moment comes, but be ready to die a dishonourable death for the sake of virtue and the truth of holy doctrines. Though it be a great and marvellous thing for someone to deny himself and surrender himself to extreme dishonour and death, it is not contrary to reason. When earthly kings go to war, they do not let people follow them who are not prepared to die for them. So it is not surprising that the King of heaven, who came to live on earth according to His promise, should seek such people as His followers in His attack upon the common enemy of the human race. Earthly kings can neither revive those killed in war, nor reward them fittingly for bearing the brunt of the battle. What could someone who is no longer alive receive from them? But in the Lord there is hope even for those who have died, if their death was in defence of what is sacred. To His followers who were daring in battle the Lord gives the reward of eternal life. Whereas earthly kings require those who follow them to be prepared to die for them, the Lord gave Himself over to death for our sake and commands us to be ready to die not for His sake, but for ours. To make it clear that it is for our own sake, he adds, “For whosoever will save his soul shall lose it; but whosoever shall lose his soul for my sake and the gospel’s, the same shall save it” (Mark 8.35). What does this mean, that anyone who wants to save it shall lose it, and anyone who loses it shall save it? Man is twofold, consisting of our outward man, the body, and our inward man, the soul. When our outward man gives himself over to death, he loses his soul, being separated from it. But when someone loses his soul for Christ and the Gospel, he clearly saves and gains it, because he has procured for it eternal life in heaven. In the resurrection he will recover it, and by means of it he will become, even in his body I say, just as heavenly and eternal as it is. Anyone, by contrast, who clings to life is not prepared to lose his soul in this way, because he loves this fleeting age and everything to do with it. He will inflict loss on his soul, depriving it of true life, and he will lose it, surrendering it along with himself, alas, to eternal punishment. The all-merciful Lord mourned for such people and indicated how great a disaster was theirs by saying, “For what shall it profit a man, if he shall gain the whole world, and lose his own soul? Or what shall a man give in exchange for his soul?” (Mark 8.36-37). For neither his glory nor any of the other deceptive honours and delights of this present age, chosen by him in preference to a death which brings salvation, will go down with him. How could any of these things be given in exchange for a human soul, which is worth more than the whole world? Even if a man could gain the whole world, brethren, it would be of no benefit to him because he would have lost his own soul. In reality, each person can only acquire an infinitely small share of this world. What a disaster, then, if someone loses his soul in his efforts to acquire this tiny share, rather than choosing to take up the sign and word of the Cross and to follow the giver of life. Now both the sign which we reverence and the word concerning it are, in fact, the Cross. As the word and the mystery came before the sign itself, we shall expound them to your charity first. Or rather, Paul expounded them before us, Paul who boasts in the Cross, determined not to know anything save the Lord Jesus, and Him crucified (1 Corinthians 2.2). What does he say? The Cross means crucifying the flesh with its passions and desires (Galatians 5.24). Do you think he is referring only to the passions of sensual pleasure and gluttony? In that case he would not have written to the Corinthians, “Since there is among you strife and divisions are ye not carnal and walk as men?” (1 Corinthians 3.3). Consequently, anyone who loves glory or money, or simply wants to impose his own will in his eagerness to prevail, is carnal and walks as men, since such things are the source of divisions. As James, the Lord’s brother, says, “From whence come wars and fightings among you? Come they not hence, even of your lusts that war in your members? Ye lust and have not: ye fight and war” (James 4.1-2). Crucifying the flesh with its passions and longings means stopping all activity which is displeasing to God. Although our body may pull us down and exert pressure on us, we must still lift it up urgently to the height of the Cross. What am I trying to say? When the Lord was on earth He lived a life of poverty, and not just lived but preached poverty, saying, “Whosoever he be of you that forsaketh not all that he hath, he cannot be my disciple” (Luke 14.33). May none of you, brethren, be annoyed when you hear us announcing, in unadulterated form, the good and acceptable and perfect will of God, nor be vexed because you think these precepts are unattainable. Bear in mind, firstly, that the kingdom of heaven is subject to violence, and the violent take it by force (Matthew 11.12). Listen to Peter, the leader of Christ’s apostles, who says, “Christ also suffered for us, leaving us an example, that we should follow his steps” (1 Peter 2.21). Then you should consider the fact that when someone really learns how much he owes the Master, and is unable to repay in full, he modestly offers as much as he can and freely chooses to. As for the remaining debt, he humbles himself before the Lord and, attracting His compassion through his humility, he makes up for the shortfall. If someone observes his thought reaching out towards riches and wealth, he must realize that this fleshly thought separates him from Christ crucified within him. How can you begin to take this thought up to the height of the Cross? Having put your hope in Christ who provides for all creation and nurtures it, keep away from all unjust gains, and do not be too attached even to honest income. Put it to good use and let the poor share in it as much as possible. It is the same with the commandment to deny the body and take up our cross. Although godly people who live according to His will have bodies, they are not too attached to them, but make use of their assistance when necessary. Should the be called upon to do so, they are ready to part with them. If you act in this way i n respect of the body’s attributes and needs, even if you can do nothing more, this is good and pleasing to God. Do you see the thought of fornication forcefully stirred up within? Be aware that you have not yet crucified yourself. How can this be done? Flee from looking inquisitively at women, from unseemly familiarity with them and inappropriate conversation. Reduce the fuel with feeds this passion by giving up excessive drinking, drunkenness, eating your fill and sleeping too much. To the renunciation of these evils add humblemindedness, and call upon God with a contrite heart for help against this passion. Then you too will say, “I have seen the wicked in great power and filled up like the cedars of Lebanon. I passed him by through self-control and, lo, he was not: I sought him in humble prayer, but his place could not be found in me” (Psalm 36.35-36 LXX). Are you troubled by the thought of the love of glory? When you are in meetings or councils, bring to mind the Lord’s advice on this subject in the Gospels. Do not try to appear superior to other when you speak. Practice any virtues you have in secret, looking only to God and seen only by Him, “and thy Father which seeth in secret shall reward thee openly” (Matthew 6.6). If, after cutting off the causes of every one of the passions, the thought of them still inwardly troubles you, do not be afraid. It will procure you crowns, since it annoys you but does not win you over, and is not active. It is a dead movement, conquered by your godly struggle. Such is the word of the Cross (1 Corinthians 1.18). It was and is, therefore, a great and truly divine mystery, not only in the time of the prophets before it was accomplished, but also now after it has been fulfilled. Why is this so? On the face of it, anyone who lowers and humbles himself in all respects seems to be bringing dishonour on himself, anyone who flees carnal pleasures appears to be causing himself toil and grief, and anyone who gives away his possessions looks as though he is making himself poor. But by the power of God this poverty, grief and dishonour give birth to inexhaustible riches, inexpressible delight and eternal glory, both in this world and in the world to come. Paul ranks those who do not believe this, and prove their faith by their actions, with the lost, or with the Greeks. “We preach”, he says, “Christ crucified, unto the Jews a stumbling block”, because they do not believe in the saving passion, “and unto the Greeks foolishness”, as they value transitory things above all else because of their complete disbelief in God’s promises, “but unto them that are called, Christ the power of God and the wisdom of God” (1 Corinthians 1.23). This is the wisdom and power of God: to be victorious through weakness, exalted through humility, rich through poverty. Not only the word and the mystery of the Cross are divine and to be reverenced, but so also is its sign. For it is a holy, saving and venerable seal, able to hallow and perfect all the good, marvellous and indescribably things which God has done for the human race. It can take away the curse and condemnation, destroy corruption and death, bestow eternal life and blessing. It is the wood of salvation, the regal scepter, the divine trophy of victory over visible and invisible enemies, even though the heretics’ followers are insanely displeased. They have not attained to the apostles’s prayer that “they might be able to comprehend with all the saints what is the breadth, and length, and height, and depth” (Ephesians 3.18). They have not understood that the Lord’s Cross discloses the entire dispensation of His coming in the flesh, and contains within it the whole mystery of this dispensation. Extending in all directions, it embraces everything above, below, around and between. The heretics abhor the sign of the King of Glory (Psalm 24.7-10), putting forward an excuse, in accordance with which, if they were reasonable, they ought to reverence the Cross along with us. The Lord Himself, when He was going to ascend the Cross, openly referred to it as His lifting up and His glory (John 3.14-15). And He announced that when He came again and manifested Himself, this sign of the Son of man would come with power and great glory (Matthew 24.30). The heretics say that because Christ died nailed to the Cross, they cannot bear to see the form of the wood on which He was put to death. But where was the handwriting nailed which was drawn up against us because of our disobedience, when our forefather stretched out his hand to the tree? How was it taken out of the way and obliterated, enabling us to return to God’s blessing? Where did Christ despoil and drive completely away the principalities and powers of the evil spirits, which had taken a hold on our nature since the time of the tree of disobedience? Where did He triumph over them and put them to shame, so that we could be set free? Where was the middle wall of partition broken down and our enmity towards God abolished and put to death? By what means were we reconciled with God and how did we hear the Good News of peace with Him? Surely it was on the Cross anb by means of the Cross. Let those who doubt listen to what the apostle writes to the Ephesians, “For Christ is our peace, who hath broken down the middle wall of partition between us; for to make in himself of twain one new man, so making peace; and taht he might reconcile both unto God in one body by the cross, having slain the enmity thereby” (Ephesians 2.14-16). To the Colossians he writes, “And you, being dead in your sins and the uncircumcision of your flesh, hath he quickened together with him, having forgiven you all trespasses; blotting out the handwriting of ordinances that was against us, which was contrary to us, and took it out of the way, nailing it to his cross; and having spoiled principalities and powers, he made a show of them openly, triumphing over them in it” (Colossians 2.13-15). Surely we should honour and use this divine trophy of the freedom of the whole human race. Its appearance alone puts the serpent, the originator of evil, to flight, triumphs over him and disgraces him, proclaiming him defeated and crushed. It glorifies and magnifies Christ, and displays His victory to the world. If it were really necessary to disregard the Cross because Christ suffered death on it, then His death too would be neither honourable nor salutary. So how can we have been baptized into His death, as the apostle tell us (Romans 6.3)? And how can we share in His resurrection, if we have been planted together in the likeness of His death (Romans 6.5)? On the other hand, if someone were to reverence the sign of the Cross without the Lord’s name written upon it, he could justly be accused of doing something incorrect. Since “at the name of Jesus every knee should bow, of things in heaven, and things in the earth, and things under the earth” (Philippians 2.10), and the Cross bears this venerable name. How very foolish not to bow the knee at Christ’s Cross! Inclining our hearts as well as bending our knees, come ,”let us worship”, with David the psalmist and prophet, “at the place where His feet stood” (Psalm 132.7 LXX), where His all-embracing hands were outspread and His life-giving body was stretched out for our sake. As we reverence and greet the Cross with faith, let us draw and keep the abundant sanctification flowing from it. Then, at the sublimely glorious future advent of our Lord and God and Saviour Jesus Christ, as we see Him come in glory, we shall rejoice and skip for joy unceasingly, having attained to a place on His right hand and heard the promised joyful words and blessing, to the glory of the Son of God crucified in the flesh for us. For to Him belongs all glory, together with His Father without beginning and the all-holy, good and life-giving Spirit, now and for ever and unto the ages of ages. Amen. From SAINT GREGORY PALAMAS: THE HOMILIES, Mount Thabor Publishing.